It appears that Lucy, the 3.2 million-year-old hominin whose fossilised remains were discovered in Ethiopia in 1974, died after falling out of a tree. Clearly only an early attempt. The archaeologists need to get back out there and look for the fossilised snake and the fossilised half-eaten apple. Eve, who unlike Lucy was content to go for the low-hanging stuff, is long gone, but the theory of evolution has become much more interesting. “I asked ‘Is it OK? Is it safe?’ and we said we would only go if we both agreed,” he said. If you need to make such a pact then you are already in a very bad place. It ended badly. Jane Wilson and her husband Gary were looking for a safe route off Snowdonia’s Tryfan peak at dusk when the incident happened, on March 25. The couple, both experienced walkers, had decided not to go to climb the summit but instead, using Mr Wilson’s smartphone to guide them, headed across the mountain’s west face. In a statement to John Gittins, the coroner for north Wales east and central, Mr Wilson said his wife went a short distance ahead of him to look for a suitable route. Mr Wilson, of Stockport, then described how he heard a kind of exclamation, then another, followed by the sound of rock fall. Jane Wilson, 53, who worked at Manchester University, had fallen 30ft down a vertical cliff, fracturing her skull and sustaining other severe injuries in the fall. 'It would have been better to have retreated the way they had come', an expert stated. Which is very often the case, but which walker ever does it? Now so many people have access to computers we have no excuse not to pay attention to the pleasing numbers that certain years produce when expressed in binary notation. Whereas we binary addicts were quite unmoved by the unpicturesque millennium year 2000 (11111010000), the respite allowed us to recover from the excitement of the year before, 1999, a much more attractive binary year (11111001111) – not perfectly symmetrical but near enough for 11 bits. 2015, the birthyear of this blog was even better: 11111011111. We shall not see its like again for many thousands of years (in 8127, 1111110111111 since you ask). For the medievalists 1365 (10101010101) has subtle beauty but was an unremarkable year historically. The George Orwell year 1984 (11111000000) was pretty good, given the aforesaid difficulties of 11 bits. We just have to hang around in this vale of tears until 4095, when we can raise a glass to 111111111111. If Christian readers take 0 (0) as the birthyear of Jesus and assume he made it until 31 (11111) they will find many nice binaries in the intervening years. Of course, really nice binaries – a bit like prime numbers – get more intermittent as the bit length increases. We know you have been excitedly waiting for this information. Here it is at last, hot from the Swiss Bundesamt für Statistik (BFS). Here are the first 100 names for boys and girls born in 2015, listed in order of their popularity. Just to annoy some sensitive people the boys' names are listed first. Even worse, in order to avoid all confusion we have given the boys' names a manly powder blue background and the girls' names a fetching light pink. Some people will find what is not there more interesting than what is there. The ability to swallow is something most of us take for granted. Crime writer Steve Mosby certainly hadn’t given it a second thought — until he suddenly couldn’t do it any more. ‘I was having lunch at home before starting writing, and had made some pasta and pesto,’ says the 39-year-old, describing the first time it happened seven years ago. After that, the problem began happening every time he ate. ‘It started half way through a meal typically and at first I didn’t think it was a big deal,’ says Steve, winner of a Crime Writers’ Association award and author of acclaimed novels such as 'Black Flowers' and 'Dark Room'. Within a month Steve, who is 6ft 3in, dropped from 14st to 12st because he simply couldn’t get enough food down. Fortunately, our dispirited crime writer had married someone with a few more brain cells. His wife Lynn urged him to see his GP, who referred him to an ear, nose and throat (ENT) specialist. Steve, from Leeds, was diagnosed with dysphagia, the medical term for swallowing difficulties. Under the rubric 'better late than never' we bring you this delightful skewering of the odious Richard North by Andrew Tyrie MP, the Chair of the Treasury Committee of the House of Commons on 13 July 2016. Q172 Chair: Okay. Is there anything you want to add, Mr North? Before you get going, I know that you were due to come before another Committee earlier this year that, for reasons I will not go into, at the very last minute told you were not required. You then said: “[The Committee] has no credibility outside its own circle and is just another symptom of the decay of Parliament as a meaningful institution.” You then carried on that you wanted to place on record “this cowardly behaviour by a committee of MPs who obviously lack both manners and the courage to address me personally, and skulk behind their staff, getting them to do their dirty work. It is a measure of these loathsome creatures, however, that they don't even have the self-awareness to be ashamed of their own behaviour.” I only wanted to put that on the record to say you are very welcome to give evidence to this Committee and we are looking forward to hearing what you have to say. This issue, or whatever it was, for the purposes of this hearing we should set aside completely. In fact, this is clearly not my day. There are plenty of interventions from fellow witness, Hosuk Lee-Makiyama, who gets 36 interventions comprising 4,864 words, while Mr Singham gets a remarkable 37 interventions, speaking for 5,608 words. On the other hand, I am rationed to 22 interventions, and a mere 2,387 words – less than a fifth of the total given to witnesses. I am allowed to speak for less than half the time given to each of the other witnesses, and asked very few supplementaries. Hmm… bit of a mystery, that one, Richard. 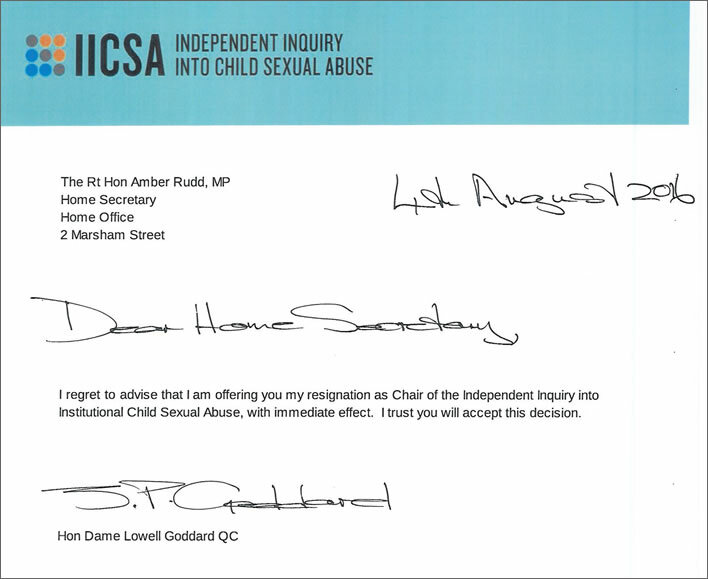 There is so much wrong with this letter that a detailed examination would be a terrible waste of human labour. The only thing we would note is the barmy modern fetish for giving official letters a 'personal note' by scribbling bits of them by hand. Why would any sane person write the date by hand? We note only that this befuddled incompetent, who can't even reproduce the name of her own inquiry correctly, was appointed with salary and conditions that can be correctly described for once as 'eyewatering' by a government minister counseled by high-flying advisors, also on impressive salaries and conditions. 'Wafted by a favouring gale', the minister is now Prime Minister and the inquiry is a heap of rubble, having achieved precisely nothing at enormous expense. Stephen Curry, Professor of Structural Biology, Imperial College London, bravely fights back tears. Friday 24th June was one of the worst days of my life. I had feared a vote to leave in the UK referendum on EU membership, but clung optimistically to the uptick in the polls in the days immediately beforehand. Even so, I was taken by surprise at the strength of feeling that the result unleashed. My immediate reaction was shock and grief. David Cameron’s perfunctory resignation as prime minister underscored the embittered sense of a self-inflicted wound, of a divided country collapsing in on itself. I went to work at my university stunned and disorientated; in committee meetings I was in no mood for small-talk. Throughout the day I fought back tears and filled my Twitter timeline with fury. The intensity of the anger subsided over the following days but the shock of the blow remained. I spoke to my children, all on the threshold of making their ways in the world, and could find little comfort to offer them. Their job prospects here and abroad seemed to have shrunk overnight. This felt like the hand of history, folded into a fist. And it kept punching, as reports came in of xenophobic attacks, given release by campaign elements that had played hard on tribal sentiment, and of Brexit leaders walking airily away from promises and responsibility. He even fought back the same tears in his favourite newspaper, The Guardian. He's such a little trooper!